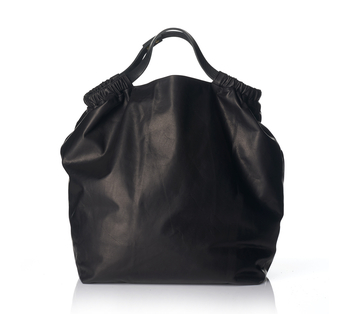 Tote Bag made in soft waxy Italian leather. This is a simplified version of a handbag, no pockets or lining just a very soft, light and clean Tote Bag. It can be used in two different ways, eihter you carry it with both handles or you pull out the handle on one side so you can have it on your shoulder. The two studs are made in solid brass. Drop-length 30 cm on the longest and 16 cm on the shortest.